UCLA Henry Samueli School of Engineering and Applied Science is a top-tier engineering school with achievements at every turn. UCLA Engineering - the Birthplace of the Internet - has always been an engine of innovation. Each year, we educate more than 4,500 students - an education that powers thousands of careers for decades. The graduates are provided an excellent undergraduate and graduate education. This prepares students to meet the challenges of the 21st century. The School’s cutting edge research and multi-disciplinary education is responsive to the needs of the society and nation, serving the profession and community with distinction. Past donors of the School. Wealth-screened prospects and acquisitions. 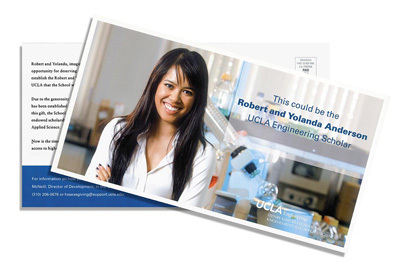 Create a variable data postcard that would feature the recipient’s name in the context of a scholarship sponsor. The recipient’s family name was prominently featured on the front of the card and in the salutation and text of the message. Along with an integrated printed and person-to-person outreach campaign, this postcard generated $936,000 in 3 months with an average gift of $33,000.